Larry Hanna and Father Michael Watson of St. Mary Church present their Apostles Build V donation to Todd Miller, Executive Director of Habitat for Humanity of Delaware & Union Counties. 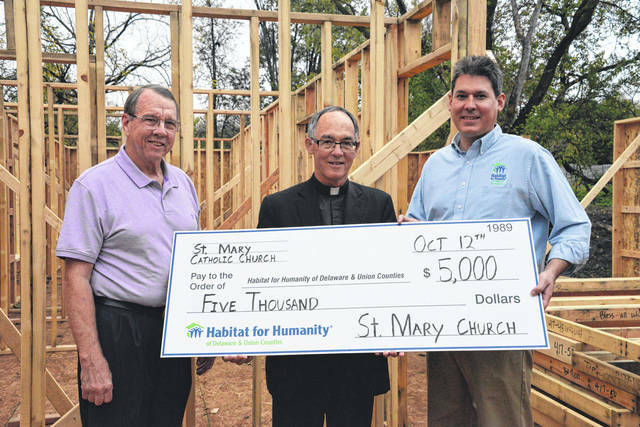 St. Mary Catholic Church of Delaware recently made a $5,000 contribution to Habitat for Humanity of Delaware and Union Counties. “The members of St. Mary parish are deeply grateful for the tremendous support of our Summer Festival shown by the Delaware community this past June,” said Father Michael Watson, the parish’s pastor. “To show our appreciation for that support, we thought it appropriate to ‘pay it forward,’ by using a part of our festival proceeds to support an agency that provides meaningful and enduring service to the community. Watson explained the significance of the work. “The Apostles’ Build projects not only provide affordable housing to hard-working and deserving families, but do so in a spirit of ecumenical Christian brotherhood that makes their efforts worthy of our support,” he said. Additionally, the parish, serving over 2,000 families, has begun a push to recruit and train a team of volunteers to work on construction and serve as support personnel for both current and future Habitat for Humanity projects. St. Mary’s Church joins 18 other Delaware County congregations in supporting Apostles Build V. An Apostles Build is a local mission project where churches join together to fund and construct a Habitat home in partnership with a local family in need of affordable housing.